Without fear of American political correctness or the nation's apparent refusal to accept men are, in fact, sexually attracted to women, we are thankful to have Che Magazine's continuing campaign which gleefully and without apology offers up women as objects of desire to increase circulation. Oh there's a joke in there somewhere but we're gonna leave that to you. Created by Antwerp's Duval Guillaume, the ad envisions the ideal desk calendar for the man trudging, wearily, through his day when he'd rather be tossing everything off his desk and throwing that hottie down on it for some intense mid-afternoon tension relief. Come on, you know it's true. Just admit it. 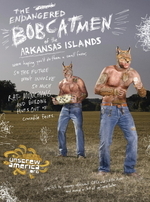 See the ad in its full sized glory here. 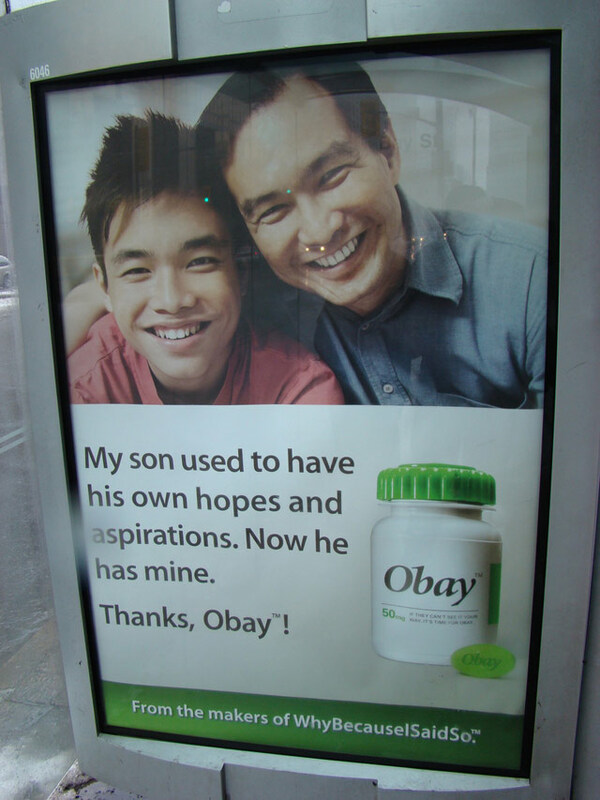 The Torontoist has been following a a local teaser campiagn which, for a couple of weeks, appeared to be a campaign from a pharmaceutical company for a fake drug called Obay. After much sleuthing, the campiagn turned out to be for Colleges Ontario, a pre-college group representing area colleges in Ontario. A teaser campaign using a fake drug is a daring move but it appears no one got lawsuit happy. The campiagn itself is funny. It promotes a drug that makes kids think more like their parents, sort of like mind control in a bottle. The ad copy is great. 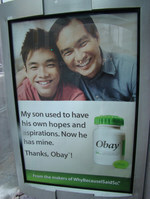 It reads, "My son used to have his own hopes and aspirations. Now he has mine. Thanks, Obay!" It's very easy to sometimes call out and make fun of the sappiness most cause-related marketing efforts are so fond of employing but if you bypass the urge to toss them off as manipulative tear jerkers, you come to realize these efforts are important and do very good things for fellow human beings. That's the case with Delta's Force for Global Good, a humanitarian effort which support Habitat for Humanity, The Conservation Fund and pink ribbon breast cancer efforts. The Denver Rescue Mission is in need of $12.5 million to support the needs of 10,000 homeless people who seek shelter each night in the city. 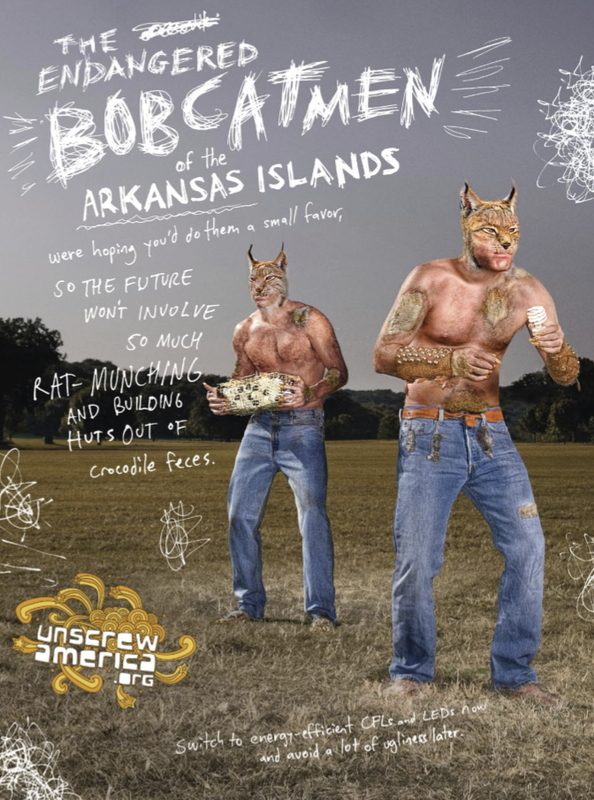 To call attention to the need, the Mission asked Cultivator Advertising & Design to develop a campaign. 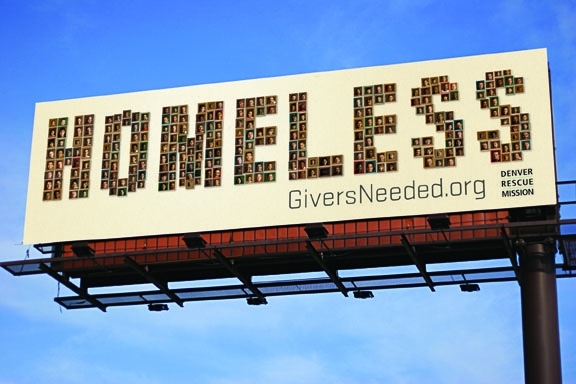 The agency came up with an interesting outdoor and transit campaign which composed the word "Homeless" from photos the agency took of 143 Denver area homeless.